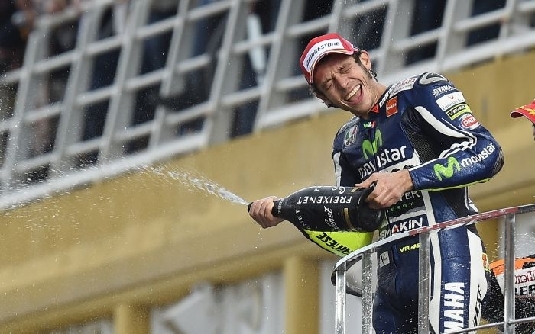 Movistar Yamaha MotoGP’s Valentino Rossi secured a superb second place under difficult conditions during the 2014 season finale, the Gran Premio de la Comunitat Valenciana at the Ricardo Tormo Circuit. Starting from pole in what began as a dry race, Rossi took off as soon as the lights dimmed and arrived at the first corner in second place behind compatriot Andrea Iannone. Followed closely by Marc Marquez, the nine-time World Champion was quick to find a strong pace, but as soon as the first lap was finished white flags were waving, signaling rain and allowing riders to come into the pits to change bikes. Rossi didn’t let the changeable conditions slow him down and set a fastest lap of 1’32.437 on lap five. As things closed up at the front, fans were thoroughly entertained with a heated battle between Rossi, Marquez and Iannone. Sparks were flying from Rossi’s bike on lap 12 as Dani Pedrosa started to get into the mix. Six laps later rain threatened again, allowing the Doctor to reel in Marquez. Rossi kept his head down, but as the track dried again he came just short and finished in a deserved second place, 3.516 seconds behind the front man. Teammate Lorenzo had an unlucky end to the 2014 season. Starting from fourth on the grid, he soon got caught up in a fight with rival Pedrosa. The Movistar Yamaha rider looked to be the stronger of the two until drops of rain began to fall and he took a few laps to get a feel for the situation, falling back to seventh. As the track started to dry Lorenzo regained confidence and rose to fifth, having retaken Cal Crutchlow and Andrea Dovizioso by lap nine. Four laps later the Spaniard arrived at the back of Iannone’s bike and won a hard battle with him before continuing his hunt for Pedrosa in third, until rain once again disrupted the race. Lorenzo struggled to get the bike stopped in the uncertain conditions and dropped down the order. He decided to come into the pits on lap 20 to switch to his wet bike and rejoined the race in 14th place. Unfortunately the gamble didn’t pay off. He dropped back to 21st and was forced to retire with five laps remaining as the conditions remained dry. With second place Rossi gains 20 championship points, securing second in the championship, with 295 points total. Lorenzo finished third in the championship as his points total remained 263. Tomorrow Rossi and Lorenzo will be back aboard the M1 on the Valencia circuit for the first test sessions in preparation for next year’s season. Monster Yamaha Tech3 Team rider Pol Espargaro charged to an expertly undertaken sixth place to finish his debut season in the MotoGP class in superb form at Valencia. The 23 year old commenced the 30 lap sprint from the rear of the second row with drops of rain falling as soon as the race began. Espargaro undertook a solid start before being pushed back to 8th at the close of the first lap, yet he powered on as the rain still fell, albeit intermittently. The young Spanish rider had slipped back to 13th on lap four, but showed a fantastic display of determination to remain firm and try to move up the field. Espargaro pushed onwards and with two thirds of the race distance covered, he had ascended though the order in a consistent manner and back up to seventh with his sights directly set on the position in front. On the 25th lap the rookie had brilliantly closed the gap to his brother, Aleix Espargaro, in front and sped past to move into sixth one lap later before speeding across the finish line in this placement. His resolute and hard fought ride saw him brilliantly achieve his ambition of seizing sixth and the title of the leading satellite rider as well the rookie of the year in the 2014 World Championship standings. On the other side of the Monster Yamaha Tech3 garage, Bradley Smith concluded his 2014 campaign with a ride to 14th after an unfortunate final round in Valencia. The British star started the race from seventh on the grid, but was shuffled down to eleventh place by the end of the first lap. However, Smith persisted with his efforts to jump back up the field in order to score a top result as he set into a fierce race pace. By lap seven, the 23 year old rider had reached eighth position and continued to climb. Yet, with more spots of rain falling at the 4005 metre Ricardo Tormo circuit, Smith unluckily fell on lap 17, before re-joining to end the lap in 20th. Nevertheless, the young British rider proceeded forward and a final dash in the last laps saw Smith make up ground as well as six places to cross the line in 14th. The performance today marks a challenging yet resolute end to the 2014 season which sees him finish in eighth position in the world championship standings. The Valencia GP, last round of the season was the perfect place for the NGM Forward Racing team to celebrate the Open class title won by Aleix Espargaro with one race in advance. A success that crowned an amazing season that saw the Spaniard among the protagonist of the MotoGP class with one podium finish at Aragon and a pole position at Assen. Today, in front of the Spanish crowd, Espargaro crossed the finish line once again as first open, conquering a well deserved seventh position, after an exciting battle with his brother Pol. With this result he secured the seventh position in the rider World Championship with 126 points. The NGM Forward Racing Team shared the same success, clinching seventh in the Team Classification with 151 points. It was a difficult race for teammate Alex De Angelis, who closed the 2014 season with the 18th position. The rider from San Marino had a good start and was fighting to get some points, but when it started to rain he lost some confidence in the rear and couldn’t defend his position.